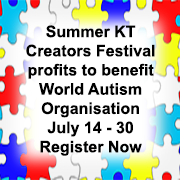 KT Festivals runs Creators Festivals a few times a year to benefit chosen charities. This season's charity is the World Autism Organisation. Creators of all kinds join in the Festival where you will find stalls of items, bargains and exclusives, "one off "auctions and hunts. We still have some spots for merchants looking for a stall at the event and would also be delighted to hear from entertainers ( live artists, dance troupes, djs etc) willing to offer their time to make the Festival a success. Registration is open to any merchant large or small but please note content has to be kept moderate.